Featuring a 1.5mm diameter aircraft cable 12" length. The Defender 1.5 is applied without any tools, making installation extremely simple. Cable cutters are required for removal. Upon cutting, the cable will fray making the cable seal unusable. 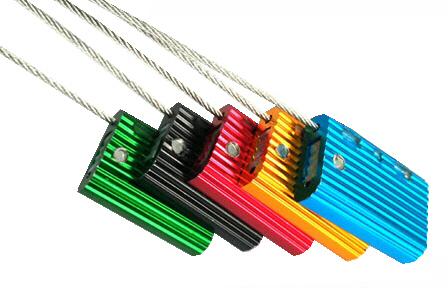 Stock seals are anodized Red, Blue Green or Black aluminum and come with a 12" long cable. An optional 36" long cable anodized in black is also available as a stock item. 100 seals per box - only $0.88 per seal.